Marquette was set to return the top seven scorers from a 24-win team that spent part of this season nationally ranked, which is why the Golden Eagles were No. 7 in the initial CBS Sports Preseason Top 25 And 1 college basketball rankings. That changed Monday, though, when Sam and Joey Hauser announced they're transferring out of the program. So now Marquette is losing two of its top three scorers. And now Marquette is out of the Top 25 And 1. I've replaced the Golden Eagles with the Davidson Wildcats. 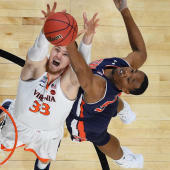 The Top 25 And 1 initially published right after Virginia won the title game of the 2018 NCAA Tournament -- and it's been updated many times since as developments have deemed updates necessary. Expect the same going forward whenever somebody projected to leave school announces he's returning to school, or whenever somebody projected to return to school announces he's leaving school. Another thing that should be noted is that I assigned every uncommitted top-100 prospect to the school most likely to enroll him, according to 247Sports' Crystal Ball projections. So that's why Cole Anthony is on North Carolina's roster, why Matthew Hurt is on Duke's roster, why Trendon Watford is on Memphis' roster, so on and so forth.